Pretty much the same thing as Kaman. Their icons are kind of a tossup as to which is better vanilla, but Nasht suffers from the same issues as his compadre. Again its the same as Kaman-Thah. I wouldn't want one without the other and as soon as both hit the table the opponent is reaching for his character removal, and only needs to hit 1 for it to work. 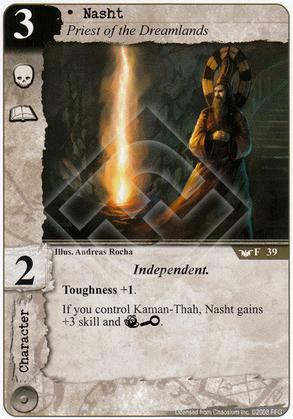 A nicely thematic card but utterly unreliable in the game, I can't think of reason to use him in a deck.